64ft is a lot of boat, but the Princess 64 packs in an abundance of features and still manages the open spaces of something larger. A dozen people could sit in the saloon and it would not begin to look crowded. And that only begins to use the facilities for sitting. 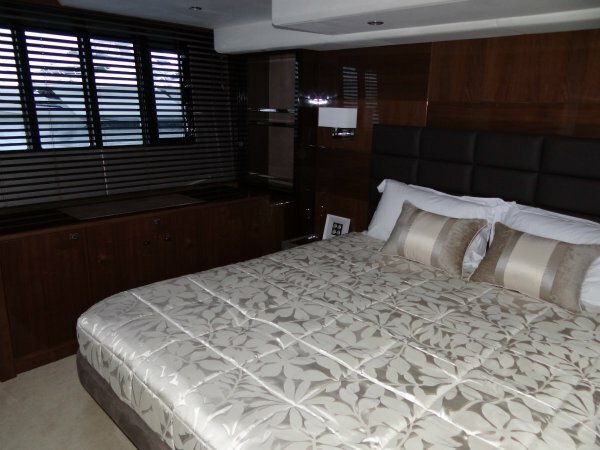 The dining saloon can seat seven, and the cockpit and flybridge between them could handle a footy team. A social boat par excellence. And a great cruising boat too; cabins for ten, four bathrooms, abundant cold and dry storage, and the range that 3400L of fuel delivers. A design principle of many northern hemisphere boats seems to be that the main use for the open air is to sun bake in it; the Australian, particularly Western Australian, idea of outdoors plus shade is alien. The 64, though, is pretty good on this. 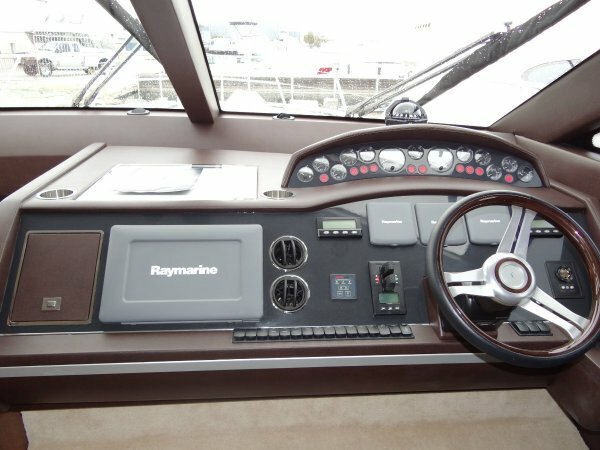 The huge flybridge shades a good sized cockpit, and the flybridge itself has a Bimini – electrically retracted for sun lovers. Another occasion for retraction might be when the barbecue is in action. Essentially there is an outdoor kitchen up here: complete with bench, sink, refrigeration and waste bin – plus the wet bar most kitchens forget. There is also an outdoor dining room where a dozen can lunch elegantly. Another thing you can do up here is drive. 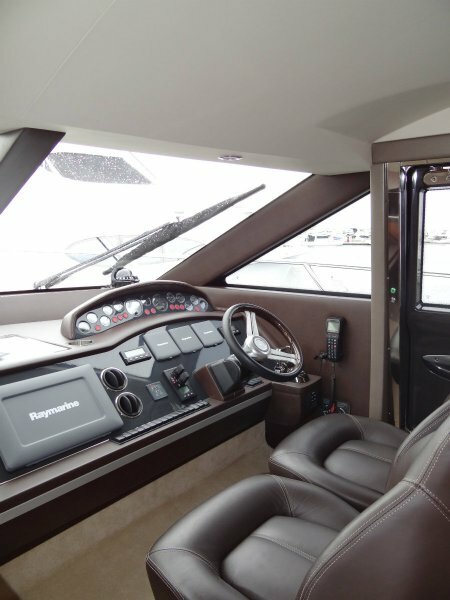 A pair of supremely comfortable seats faces a NASA-style console with electronics remoted from the lower station, although when shorthanded you would probably choose downstairs for berthing, with its side door giving quick access to the bow. 34T of boat plus another 5T of liquids makes for a lot of inertia, but manoeuvring the Princess is surprisingly easy. 2300hp from the twin Caterpillar C18s plus both bow and stern thrusters make light work of it. When berthing light work applies again: power capstans do the hauling alongside and the gangway is deployed by the result of button pushing. The cockpit offers yet another dining space, but more importantly a spillover from the saloon; for cocktails at Rotto several dozen people could fit in. There is also enough room for a bunch of divers or swimmers to gear up, particularly if the swim platform is roped in as well. This platform is hydraulic, and big enough to carry a useful sized tender. Side deck access forward is good. The decks are not wide, in the interests of maximizing interior space, but the side rails are splayed out and there are continuous grab rails for the other hand. 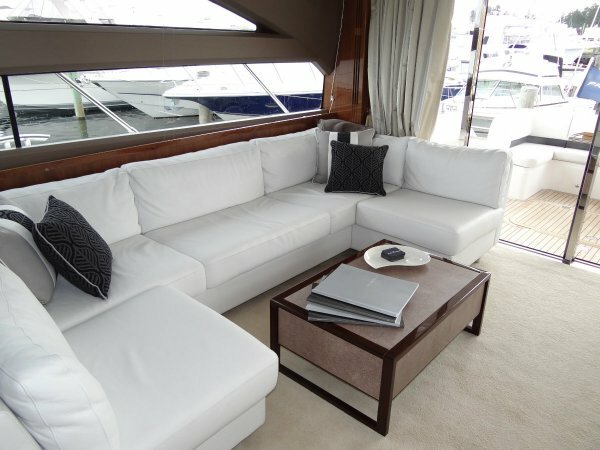 The foredeck is a natural sitting spot, and one of the inevitable European sun beds lives there. 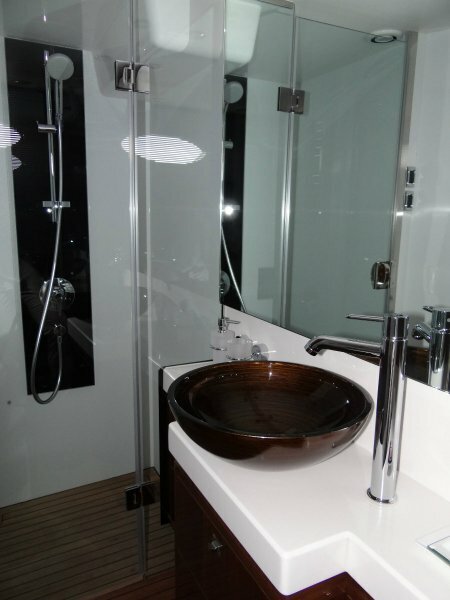 It is almost superfluous to describe the fit-out standards. British imports are extremely well finished, with possibly a better choice of timber than most US boats. A feeler gauge test on the cabinet work confirmed what the eyes suggested: a near perfect fit. 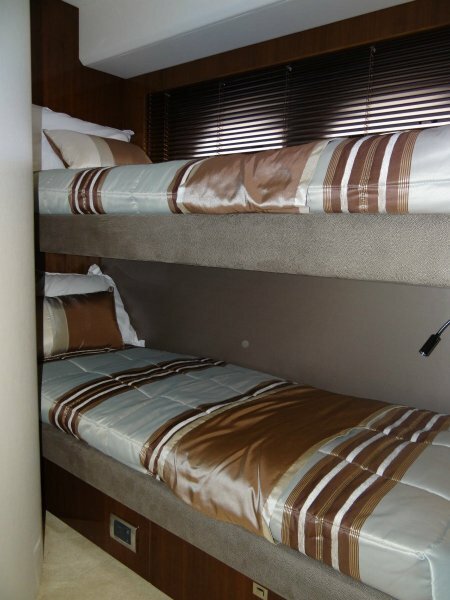 Upholstery is leather, of course, towel rails are heated, the sound system is adjustable for every compartment, as is the air-conditioning; every compartment has TV-DVD. It goes on. 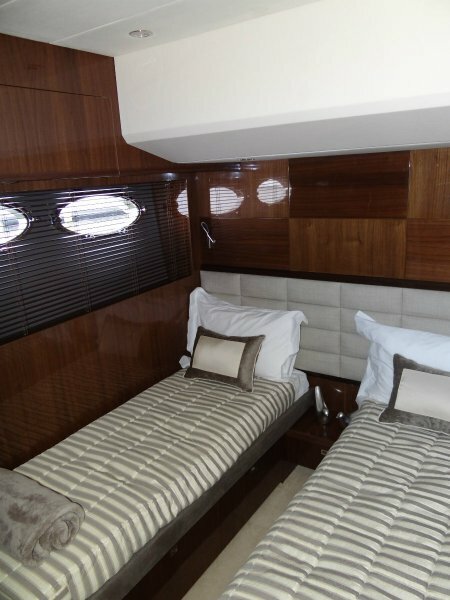 The sleeping accommodation is described as four cabin, but the crew cabin aft with en suite is hardly second class and is far more likely to contain passengers than crew. 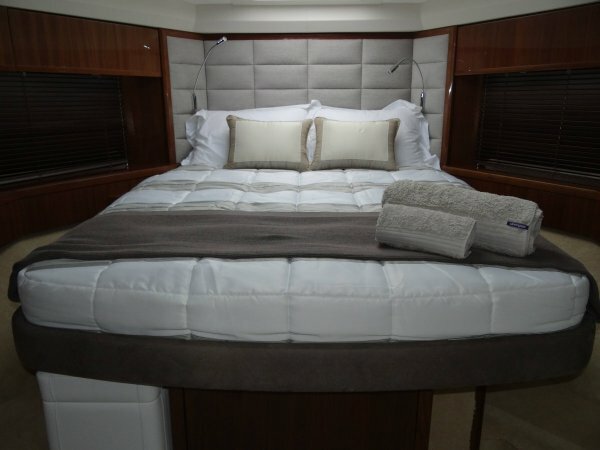 The master suite amidships gets the full five metre beam, a fair chunk of the length, and a good percentage of the glass area. Like the other cabins the inner spring mattress has decades of sleep in it, and there is surely more storage than any two people could use (my wife disagrees). 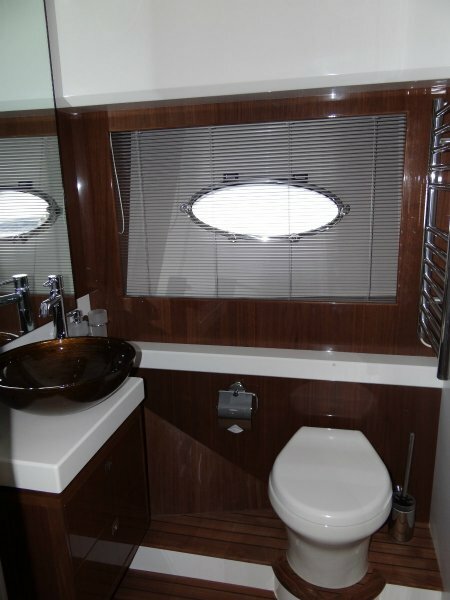 One of the twin cabins is of modest size, but in general the above deck theme of uncluttered space continues down here. A word about the galley: it is excellent. Conveniently placed opposite the dining space, it has a semi opaque sliding screen to hide it from sensitive eyes in the saloon – but it is worth looking at. Fitted drawers to contain the Princess cutlery, glassware and crockery; four burner stove; convection microwave; domestic size fridge and freezer; dish washer; ice maker; and super importantly, space for better cooks than I to assemble meals worthy of a $2.99m dollar vessel.